The forever war: When will we stop using a September 2001 authorization of military force to sanction our overseas conflicts? When will we stop using a September 2001 authorization of military force to sanction our overseas conflicts? 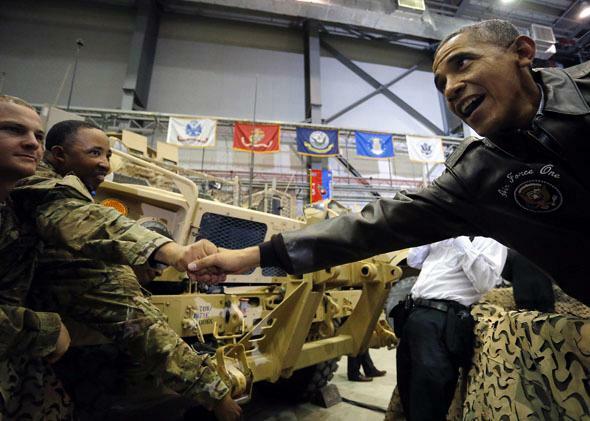 President Obama shakes hands with troops after speaking at Bagram Air Base in Kabul on May 25, 2014. Thirteen years after the United States invaded Afghanistan, the forever war goes on. It’s now been more than a year and a half since President Obama told an audience at the National Defense University that “this war, like all wars, must end. That’s what history advises. That’s what our democracy demands.” The “war” he was referring to was the amorphous set of military engagements around the world launched by his predecessor George W. Bush following the 9/11 attacks. That war has now been raging for 13 years. And despite Obama’s declaration in 2013, it shows no sign of ending anytime soon. The United States doesn’t actually declare war anymore—the last time it did was World War II—but Congress still sanctions American combat through authorizations for the use of military force. The AUMF, which authorized the president to use “appropriate force against those nations, organizations, or persons he determines planned, authorized, committed, or aided the terrorist attacks that occurred on September 11, 2001, or harbored such organizations or persons,” was passed by Congress with only one nay vote—Rep. Barbara Lee, a Democrat from California—on Sept. 14, 2001. The 2001 AUMF specifically applied to the perpetrators of 9/11 (al-Qaida) and those that harbored them (the then-Taliban-controlled government of Afghanistan). Over time, though, the Bush and Obama administrations have interpreted it more broadly to apply to “associated forces” of al-Qaida—language that was not in the original authorization. It has also provided the legal basis for strikes on groups that didn’t exist at the time of 9/11, like the Yemen-based al-Qaida in the Arabian Peninsula, as well as entities like Somalia’s al-Shabaab that share the global terror network’s ideology but whose goals are primarily local. Osama Bin Laden is dead, the global network he created is a shell of its former self, and most of the planners of 9/11 have been killed or are languishing in Guantánamo. But whenever the CIA launches a drone attack against a Taliban target in Pakistan or U.S. special operations forces swoop in to nab an al-Qaida suspect in Libya, the mandate of the 2001 AUMF—a two-page resolution passed into law 13 years ago for a completely different purpose—lives on. To borrow the title of Dexter Filkins’ book on Afghanistan and Iraq, it has created a forever war, one limited by neither time nor geography. This was a rare instance of a president asking Congress to limit his own power. But since that time, the AUMF hasn’t been refined or repealed and Obama hasn’t brought the war to an end. Rather, he’s expanded it. The U.S. began launching airstrikes against ISIS in Iraq on Aug. 8. The campaign expanded into Syria on Sept. 11 of this year. The War Powers Resolution, passed in the wake of the Vietnam War, gives the president 90 days to conduct a military operation before Congress must approve it, but as of now, 124 days after it began, the war against ISIS has not been authorized. The White House has also made the case that the operation is covered by the 2002 AUMF that authorized the original invasion of Iraq. One might have assumed that the scope of that authorization ended when U.S. troops pulled out of the country in 2011, and that it did not amount to permanent permission to bomb Iraq whenever and however the president wanted. Despite its claim that the 2002 AUMF should cover the fight against ISIS, the administration told the Times that “our position on the 2002 AUMF hasn’t changed and we’d like to see it repealed.” In the case of both AUMFs, then, the White House wants to have it both ways: The administration thinks they’re no longer valid, but so long as they’re still on the books, it’s perfectly willing to continue using them. Menendez’s proposal would put the ISIS “war” on firmer legal footing, limit the engagement to three years, repeal the 2002 Iraq AUMF, and—much to the consternation of Republicans on the committee—place constraints on the use of ground troops. It would also leave the 2001 authorization in place. Even if the measure passes through committee, full congressional approval seems almost impossible this week. Schiff has twice unsuccessfully proposed amendments that would sunset the original AUMF. His proposal for a specific ISIS authorization would also have repealed the 2001 AUMF. Schiff says he believes the president was serious about his desire to repeal the AUMF and would likely be “uncomfortable leaving a legacy of unbridled war-making power in the executive.” When it comes to the lack of movement on a new AUMF, either for Syria or generally, he says there’s plenty of blame to go around. “It’s a combination of the administration not being confident in whether it can get what it needs out of Congress and therefore not coming to Congress with a draft, and a Congress that isn’t eager to take up an issue that may later come back to bite them,” he says. These attitudes may be cynical, but they aren’t unfounded. The last time Obama asked for authorization to bomb Syria came following Bashar al-Assad’s use of chemical weapons in the summer of 2013. At that time the president faced heavy public and congressional opposition to the idea of a new military engagement in the Middle East. (The rise of ISIS and, in particular, the gruesome videos showing the beheadings of American journalists in Syria have since changed these attitudes.) In the end, a last-minute deal facilitated by the Russian government, under which Assad agreed to ship his remaining chemical weapons out of the country, prevented what could have been a humiliating political defeat for the White House. From Congress’s point of view, there’s not much to be gained politically from taking ownership of a military operation that could turn out to be a costly disaster. The fact that so many congressional Democrats were willing to authorize Bush’s wars is part of the reason why Barack Obama, who publicly opposed those wars, is president today. For the soon-to-be Republican-controlled Senate, the shrewder move is to sit back and criticize the administration’s conduct of the war without getting its own hands dirty. As Wittes puts it, “You have an understanding between the executive and the legislature that amounts to ‘don’t ask, don’t tell.’ ” Everybody seems to know this is no way to run a war, but nobody’s in a huge hurry to do anything about it. This may work out well politically for both sides—the White House gets to have its war, and Congress gets to attack it. But in the long run, Congress isn’t performing one of its most important oversight functions. “We’re really derelict in our constitutional duty in putting this off during a war,” says Schiff. This has implications beyond Syria. The White House announced last month that the U.S. combat role in Afghanistan would be extended into 2015, despite an earlier pledge that U.S. troops wouldn’t take part in combat past the end of this year. The forever war is still being fought on several fronts. Some sort of anti-ISIS authorization is likely to be passed in the next Congress, though one that repeals or places a time limit on the 2001 AUMF may be a long shot. Democrats will likely push for an authorization that prohibits “boots on the ground,” while for Republicans, as Wittes puts it, “there will be a lot of temptation to put in things to make the administration look weak, to authorize things they would never do.” This could include expanding the operation to target Bashar al-Assad’s military, something that some Republicans—notably John McCain—have pushed for but the White House has steadfastly avoided. The upcoming AUMF debate could be a test case for Rand Paul’s brand of anti-militarist conservatism heading into the 2016 election cycle. Repealing the bill will require a combined effort from the Democratic left and Republican right against the generally more hawkish middle. Ackerman, a self-described liberal Democrat, notes with some satisfaction that Paul has lately taken to citing the Yale professor’s arguments to contend that Obama’s wars are unconstitutional. The problem we’re facing now, though, is that a resolution meant to target a specific group of terrorists was transformed into something else entirely due to a lack of geographic or time constraints. If Congress heeds Kerry’s advice, then the forever war against al-Qaida could simply be replaced by a new one against ISIS. Of course, while Congress debates, the situation is shifting on the ground in Syria. Wittes notes one unexpected twist. There have recently been scattered reports of ISIS patching things up with Jabhat al-Nusra, the al-Qaida-affiliated group it has fought against for the past year and that has also been a target of the U.S. bombing campaign. The talks have reportedly involved the Khorasan Group, a clique of veteran al-Qaida fighters from Afghanistan and Pakistan. This alliance would lend some credence to the administration’s argument that ISIS is covered under the 2001 authorization. “The more that ISIS and al-Nusra work together, the more valid the argument becomes,” Wittes says. It would certainly be ironic if ISIS and al-Qaida got on the same page before the White House and Congress did.